one of the world’s leading Ayurvedic masters, Vaidya Smita Naram. When spring marches in, we naturally want to throw open the windows of our home and clean out all the dust and cobwebs. In the same way, Ayurveda recommends that we give our bodies an annual spring cleaning! Once the autumn chill descends, and all the way through the cold winter, we tend to eat heavier foods. This way we can put on a little fat to stay warm. Spring invites us to help the body transition to the new season by eating lighter foods. Have I told you that I love fresh pumpkin (see Spiced Pumpkin Pound Cake)? 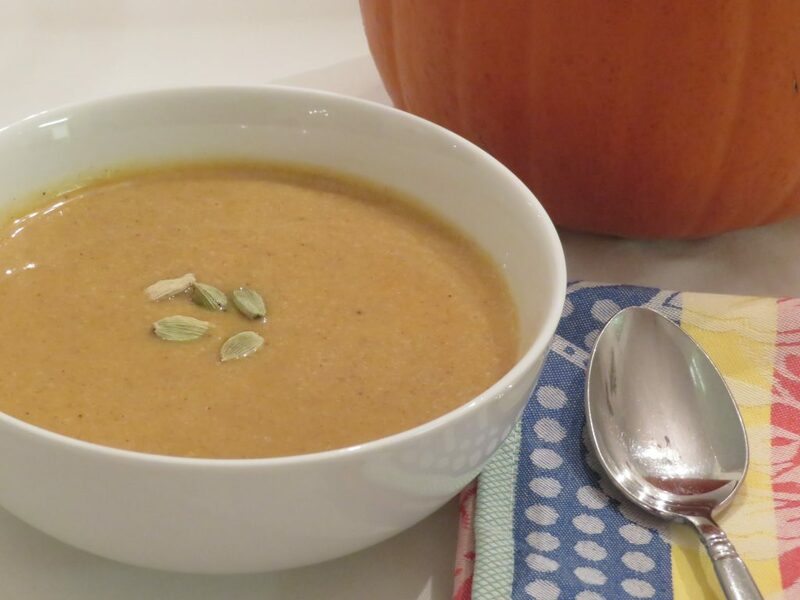 As the holiday season moves toward its peak, what can be better than a fresh Puréed Pumpkin Soup. The markets are still filled with sugar pumpkins, the sweet edible pumpkins used for pumpkin pies and all things pumpkin. 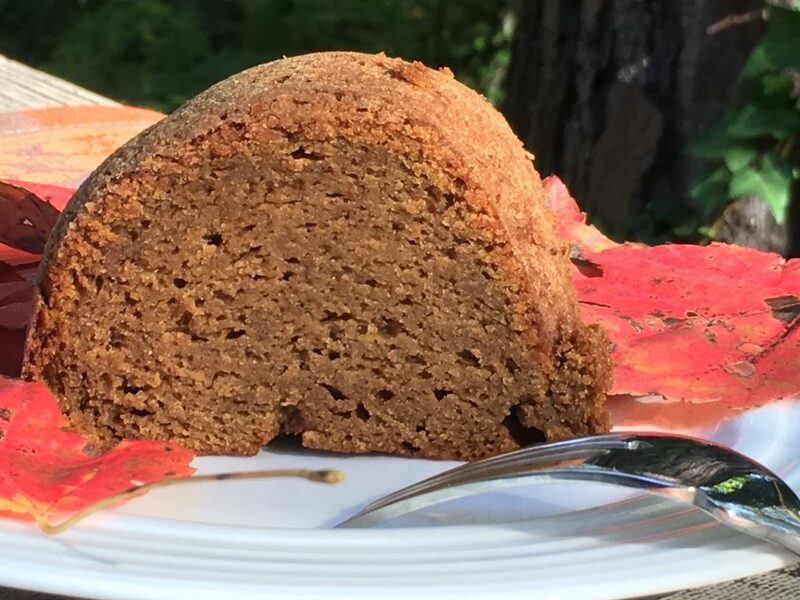 I love this Spiced Pumpkin Pound Cake. It’s a way to enjoy the holidays without getting a sugar high that’s followed by the inevitable sugar crash! This cake is wonderfully moist but not overly sweet, and it’s won rave reviews wherever I take it. 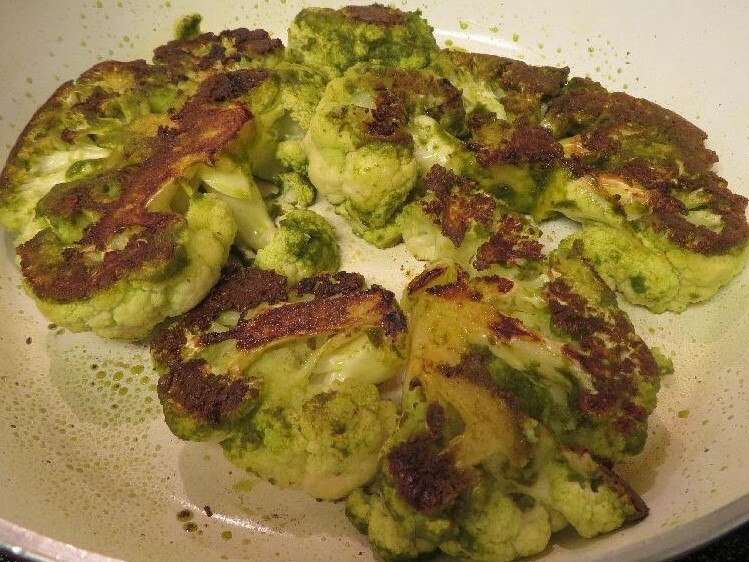 I tasted this scrumptious cauliflower dish at The Well Fed Community Garden in Raleigh in late May when Arthur Gordon, of Irregardless Cafe fame, created the dish on the spot! He gathered up whatever looked fresh and interesting at the farmer’s market along with herbs growing in the community garden and—voila!—came up with this amazing dish! I’ve adapted it only slightly to serve eight instead of eighteen and made it a tad milder so it doesn’t bring on more heat in this sweltering summer.The complete dish is a cauliflower “steak” that is rubbed down with a mixture of fresh herbs, roasted or sautéed, and topped with a red pepper cashew sauce. The first time I made this myself, I ran out of time and served only the first part of the dish, pictured here—cauliflower with herb rub. That alone was delicious! So, if you want a simpler dish to make for a July 4th bash, you won’t be disappointed. A third option, also simplified from the original, is to skip the marinade. You chop the florets, grill them (or sauté them in a little salted oil), and top them with the cashew sauce. If you want to go the extra mile to impress your guests, I recommend making the full dish: rubbed cauliflower steaks with red pepper cashew sauce. The sauce is simple, and you can use it over any of your favorite vegetables. I’ve found it wonderful over grilled summer squash, plantains, and sweet potatoes—foods I like to see on a summer menu! Finally, if you want to replicate Arthur’s dish more precisely, you can add some hot sauce to the red pepper/cashew mixture. It’s a flavor I always avoid, but I know many people love it! Wishing you all the freedoms hoped for when our forefathers proclaimed their independence on July 4, 1776! 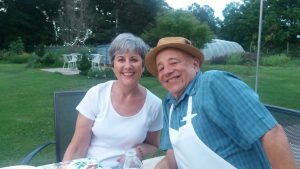 Lisa with Arthur Gordon, founder of the Well-Fed Community Garden and Irregardless Cafe. Auspicious New Beginnings with Black-Eyed Peas! 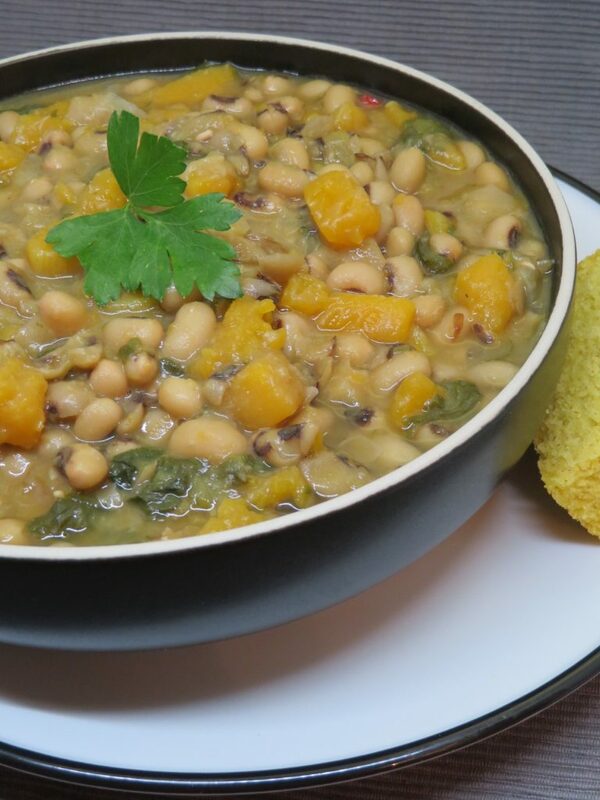 Ask any Southerner how to start the new year in the most auspicious way, and they won’t even blink before naming a bowl of Hoppin’ John or some other version of peas and greens—like this vegetarian Black-Eyed Pea Soup with Collards! Serving such a dish on New Year’s Day is thought to bring good luck because long ago black-eyed peas reminded someone of coins. The greens are said to bring prosperity because greens are associated with green cash. If you enjoy food history, you can read more about this legend at Southern Living and Epicurious. My Black-Eyed Pea Soup is filling because of the generous proportion of peas, and it is made even more satisfying by the addition of butternut squash, a favorite winter vegetable. If you serve this soup over rice, like a traditional Hoppin’ John, you will need little (if anything!) else at your New Year’s Day table. How can you make your New Year’s Day even more auspicious? If you love sweet potatoes, I have good news for you, along with an easy and oh-so-delicious Southern-style recipe! And in case you’ve been following my blog and wonder why I cook with so many sweet potatoes, here’s one reason why: according to Ayurveda, sweet potatoes are one of the best foods for grounding high vata — that light, airy, buzzing energy that you feel when life is moving just a little too fast. If you want to plan an intensely flavorful vegetarian menu for Thanksgiving, look no further! Today I’m sharing a recipe for Gluten-Free Millet Dressing. I’ll also point you to my sumptuous versions of traditional American holiday side dishes, which will fill your family with joy and gratitude! Why millet? Millet is a good source of vegetarian protein. One cup of cooked millet offers 6 grams of vegetarian, gluten-free protein, which equals the protein in one egg. It’s also filling, grounding and easy to make. Now for the rest of the menu. My famous Holiday Sweet Potatoes, topped with a pound and a half of pecans, are the eagerly awaited crown jewel of our holiday table. For a dash of freshness and color I offer this cranberry salad, a squeaky clean, upscale version of the canned stuff that used to be served when we were growing up! This curry leaf and cilantro chutney recipe comes from Vaidya Smita Naram. She whipped up this lovely sauce in our Vitamix in about 5 minutes while recently staying in our home. My husband, Tom, and I happily poured it over mung bean “burgers” I had made for dinner. A few days later I prepared another cup of the chutney, which we used to top off savory chickpea pancakes that Dr. Smita showed me how to make a half-hour before we drove her to the airport for her flight home to Mumbai, India. Chutneys are relishes or sauces that are staples in Indian cuisine. They are also used in Ayurvedic cooking when freshly made. There are innumerable kinds of chutneys — some chunky, others that are more like a paste, and liquid sauces. Chutneys have a reputation for being amazingly hot to the tongue because most Indian cooks spike their chutneys with chilies. Not so with this recipe! Authentic Ayurvedic cuisine avoids the use of chilies except for people who are predominantly kapha types. 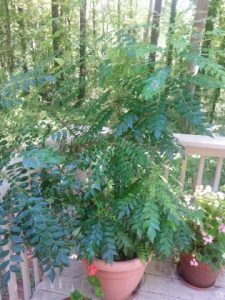 Nonetheless, this chutney is guaranteed to add a bolt of flavor to any dish along with potent healing power. Fresh vegetable stock makes all the difference when cooking soups, sauces and many other recipes. The good news is that you can put a simple stock together in 10 minutes or less. It cooks while you start other food preparation, or you can walk away and leave it on the stove to simmer. Here’s an easy-to-make, completely satisfying vegan Black-Eyed Pea Salad. Quick, delicious and healthy to boot. Black-eyed peas are especially appreciated by vegan and vegetarian cooks because the peas will be tender after boiling in about 30 minutes, unlike harder beans such as black beans and chick peas that take an hour or more to cook in a regular pot. With black-eyed peas you’ll have a protein-rich main dish that you can build a summer meal around with very little labor—a gift to the cook on a hot summer night. If you’re too hungry to wait for the black-eyed peas to cool, no problem! 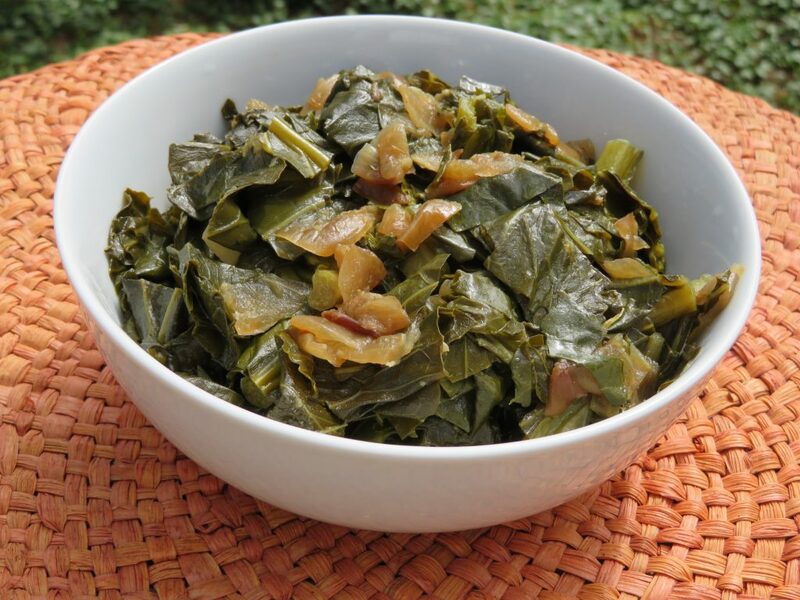 This quintessential Southern food is equally appealing when eaten warm after it’s just been cooked. Once the salad is chilled, it’s an ideal dish to serve at your 4th of July picnic. Copyright © 2019 by Lisa Joy Mitchell. All rights reserved. The ideas and suggestions contained on this web site are not intended as medical advice or as a substitute for appropriate care of a licensed health care practitioner and such a practitioner’s dietary recommendations for specific health conditions. The publisher is not responsible for your specific health needs, food sensitivities or allergies, which may require medical supervision. The publisher is not responsible for any perceived adverse reactions to the recipes contained in this book. Book cover design by Tabitha Lahr | Illustrations by Karin Michele Anderson www.karinmicheleanderson.com | Web design by Ingrid M. Beckman www.IngridBeckman.com | Photos by Roger Winstead, and one each by Robert Bell and Jeanne Reineit. Home page banner photo by Ingrid Beckman.